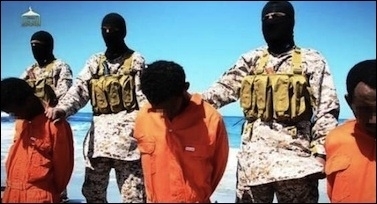 The Islamic State has just released another video where it executes more Christians, this time for not paying jizya — the tribute demanded of Christians according to Koran 9:29 in order to live under Islam as Christians. Two scenes appear in the 29-minute long video. The first scene consists of a group of Christian Ethiopians dressed all in black, with armed and masked Islamic State members standing behind them. According to the video, this scene takes place in the city of Fezzan. The Ethiopian captives are called "Nationals of the cross, from among nationals of the Ethiopian Church." The next scene is of the Christians in Fezzan being executed with gunfire and the Christians in Barqa being beheaded. Other scenes include the narrator referencing the fatwas of medieval jurist Ibn Taymiyya that proclaim all Christians "infidels." Abu Malik ibn Ans al-Nashwan, apparently one of the group's leaders, also appears saying that "The dealings of the Islamic State with Christians under its authority is according to Allah's Sharia [Islamic law]. Jizya [tribute] is imposed on those who accept, and war on those who resist." He added that the Islamic State invited the Christians of Raqqa, Syria to enter Islam, but they refused. So IS demanded of them payment of jizya and they complied and were permitted to live. Next follows a scene depicting Christians in Raqqa — according to the video's claims — saying how "peaceful" life is under the Islamic State, and that the caliphate does not compel them to do anything except pay jizya. The video shows other scenes and cities under IS' jurisdiction, including pictures of churches in Ninevah and Mosul in Iraq being destroyed purportedly because Christians there refused to pay jizya.